I’ve never been to Adelaide during peak festival season, a sad fact that I’m planning to rectify this weekend. When Adelaide Writer’s Week was announced, I spent several weeks wondering if I should commit to going (like I do every year) until the spectacular program eventually won me over. The guests includes a strong list of Australian authors and a particularly exciting handful of internationals – Jesse Ball, Laura van den Berg, Lauren Groff and Catherine Lacey are my personal favourites. Plus the entire program is free! This is worth the price of my flights alone. I wrote about my festival picks here, so you can read along from home. I’m re-reading Lacey’s Nobody is Ever Missing in preparation, one of my favourite novels from last year – raw, darkly funny and utterly unique. If you’re keen to read more about this novel, I highly recommend my friend Kylie Maslen’s review on her blog, Book-Plate. I finished an advanced copy of this March release a couple of weeks ago and was so affected by it that I only now feel able to coherently discuss it. Set in suburban England, this book follows 11-year-old Shruti. She’s worried about the the possibility of being separated from her mother – who’s under pressure to remarry and return to India without her daughter. Shruti then meets school newcomer Meena who becomes a strong influence upon the former’s future decisions and actions. From discussions I have read thus far there seems to be a strong division of opinion regarding this book (in my view making it an excellent choice for book groups). The main point of contention seems to be the second half of the book and whether it should be taken literally or metaphorically. My verdict? I was somewhere in between with my interpretation and certainly at times questioned the dramatic shift in plot. However, I was so mesmerised while reading this novel and couldn’t stop thinking about it for weeks afterwards that I ultimately have to acknowledge it as a significant and powerful reading experience. Dutch author Thomas Olde Heuvelt is one of those wunderkinds who publish their first books in their teens, and go on to do disgustingly well for themselves. Now 32 and with a slew of awards under his belt he’s publishing his first English language novel. Hex is a bestseller in the Netherlands, and Warner Bros is currently developing a TV series based on the book, so there’s already plenty of buzz. Hex is a weird and surprisingly funny horror novel about a town called Black Spring, which is under the curse of a witch who was burned at the stake in the 17th century. Katherine (or ‘Gramma’ as the townsfolk affectionately refer to her) wanders the streets day and night, chained, with her mouth and eyes stitched shut. The town is preoccupied with projecting an illusion of normalcy to the outside world – they track her movements with an iphone app, pop up the occasional shrubbery disguise, and just generally try to keep her a secret from visitors. But the teens of the town are chafing under the limitations imposed upon them, and they’re determined to discover what’s at the heart of the Black Spring curse. I’m about halfway through Recipes for Love and Murder. 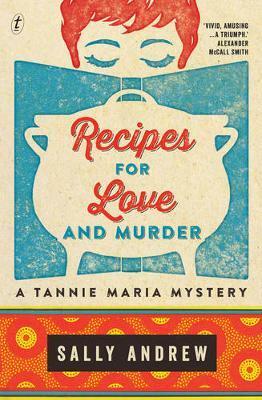 I love a cozy mystery, particularly when food is involved, and I was delighted to find that this first Tannie Maria mystery is South African. I used to live with three South Africans in London who frequently insisted upon having a braii (Afrikaans for barbeque) in the middle of the British winter, so this novel is giving me lovely flashbacks to that period of time. The murder and characters are compelling and I’m really enjoying reading about a country that I know only a little about. I also just started The Tenant of Wildfell Hall. I’m one chapter in and I am enthralled. It’s tense and stressful – and I can’t wait to read more. However, I also want to savour the story so I’m only reading a little bit before bed each night. I’m not going to lie, I’m pretty excited for the AFL to start again. However, it’s hard to ignore the way that – despite having arguably the most vibrant and diverse fanbase of any sport in Australia – overwhelmingly blokey voices dominate football culture. This is why it’s been so refreshing to read an early copy of From the Outer, an anthology of writing that foregrounds female, LGBTIQ, Indigenous and immigrant voices, from inside and outside the game, all talking about what football means to them. Anna Spargo-Ryan’s piece about bonding with her grandfather over the Norwood Redlegs is a highlight, as is Tony Birch’s melancholy musing on the demise of the Fitzroy Lions and its effect on his sense of identity. While I wish there was more mention of my beloved North Melbourne, the book is an entertaining and enlightening antidote to yet another grim off-season. The title alone didn’t floor me and it took a while to get into the rhythm of the story, written in a style that I mostly associate with decades past - lots of “whom” and “Oh—! How I yearned!” (I’m paraphrasing; it’s never that sentimental.) After a while, I realised the writing had a way of disarming me entirely, turning the story of Lucy, a young mother confined to a hospital bed for weeks whose mother has come to visit, into something a deeper, darker vision of the flaws of memory, the past’s vicelike grip on Lucy’s state of mind, and a childhood so visceral and awful I wanted to adopt the book and take it for a nice day out at the zoo. Strout is a powerful writer, who can do a lot with very little; prepare to be shaken by this beautiful little hardback. When cookbooks took over the shelves pre-Christmas I spotted, but then neglected, this particular title. Now, having taken a closer look, I’m very taken with it. Putting aside the very lovely design with spattering of Crabb’s vintage wardrobe and decorating tendencies it’s the idea of the collection that puts a smile on my face. Crabb and Sharpe have been friends since primary school and always shared a love of cooking. From making spanakopita with their Greek teacher at school, community catering with their mothers and sleepovers with grandparents to adult life where they tried to live in the same city to allow the continuation of culinary visits. Crabb lovingly describes how when her first child came Sharpe would deliver twice daily home-prepared meals to her flat. It’s this love of cooking for giving that radiates in the book. Of course the recipes are good. They are not only filled with years of love through giving, sharing and correspondence but lashings of flavours and combinations I had not always considered. Reading through the soups section in the heat earlier this week, I was salivating, and by the time I got to desserts I was seriously considering turning the oven on, despite the stupidity of baking in such weather. I look forward to doing so very soon.